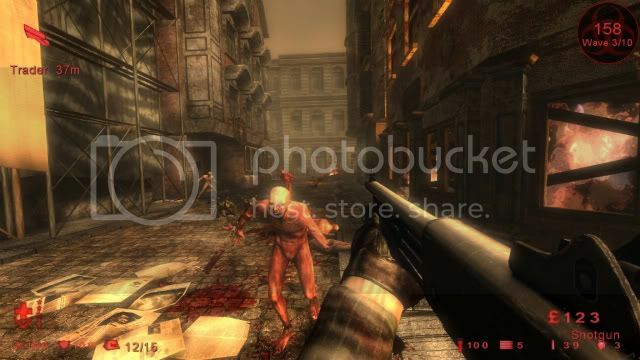 Killing Floor, a modification project started a few years ago for Epic’s Unreal Tournament 2004, is now a standalone project helmed by Tripwire Interactive. 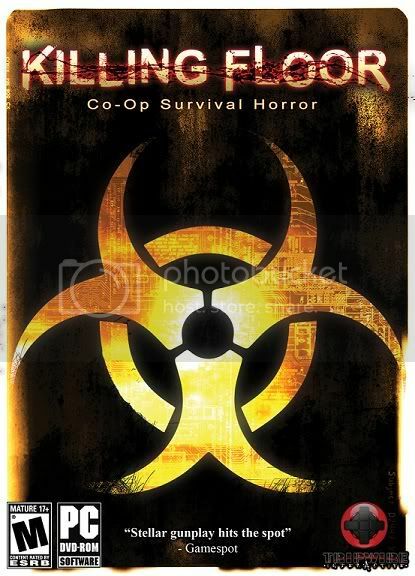 Killing Floor is a co-op survival first person shooter (FPS) which runs about twenty bucks on Steam (or through other online and retail stores). The game had been a very small blip on my radar when compared to the other shooters that released in 2009, but after trying it recently, I can say that those craving a different (and cheaper) zombie fest will find a lot to love in Killing Floor, wrinkles and all. Included are two modes, Solo and Multiplayer. The first is a practice mode of sorts to help ease you into the core gameplay, while the second is the real meat of the game. Once you find a server (which are still showing strong numbers) and choose your character and Perk (a designated “class” which is explained later on in the review), you’ll be dropped into the map with nothing more than a knife, 9MM handgun, and some grenades. You and your crew will then fend off wave after wave of “specimens”, cloned experiments from the seedy Horzine Corporation. These waves can be customized depending on the server, from short, medium, or long games, on four different difficulties, or with certain mutators (small game altering conditions, e.g. Clots only) activated. Between each growing wave, there’s a small break to outfit your character with better weapons or to restock on ammo from a Trader that spawns at various locations around the map. Killing Floor’s arsenal includes staples like a chainsaw, axe, assault rifles, shotguns, explosives, a flamethrower, crossbow, and yes, even a rocket launcher. To pay for these all these goodies, you’ll need to do some killing first, and lots of it. You gain cash depending on what you kill. Each wave will spawn a certain number of enemies, more depending on the team size, difficulty and game length. Early waves introduce the Clot, your run-of-the-mill shambling clone that can latch onto players if they get too close. There’s the Gorefast, a red specimen that rushes players with a blade on his arm, and the Bloat, a portly and repulsive bloke that slowly shuffles around the map showering anyone close enough with acid. Further waves introduce Crawlers, the cloaked Stalker, flame-throwing Husk, as well as the eardrum blasting Siren. End levels bring the chainsaw wielding Scrake and the towering Fleshpound, a meat grinder that gets mad very easily, and has the potential to wipe a small team on its own. All these waves build up to a final battle with the Patriarch, an impressive boss that can kill a squad member in seconds if they are not careful. If successful in killing the boss, players move onto the next map to repeat the cycle. Disabling special abilities from specimens like the Bloat’s acid is easy if you remove the head. One thing that takes getting used to is not having crosshairs on almost any of the weapons. Killing Floor takes a more realistic approach to its gun play, which is easily one of its strengths. If you’ve ever played a Call of Duty game before, you will be at home here with the “Aim Down Sights” game play. 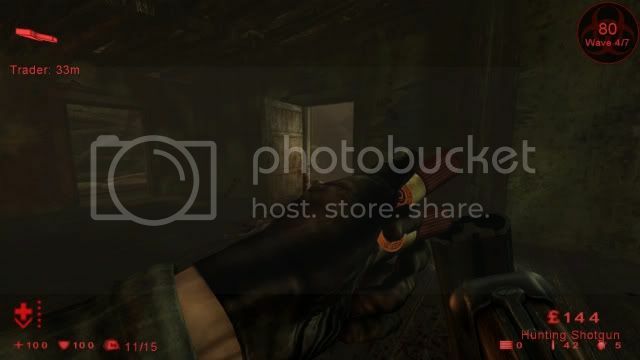 Scoring headshots randomly awards what the game calls “ZED-time”, slow-motion for the entire server which gives players a few seconds to place multiple precise shots; or allows you to see a Clot flinging through the air after a shotgun blast, none of which, ever gets old. Level design is well-made, especially from the community mappers. Given the spacious areas and the claustrophobic rooms in each level, the constant hoards of specimens pouring through every nook and cranny really make for some hectic moments. Should the team stay in a tightly guarded hallway, or maybe move to a second floor that has multiple openings? Move out into the street or stay in a tunnel? Each game always plays differently due to the sheer variety that maps offer. Killing Floor has up to seven different Perks that tailor to certain play styles. Not afraid of needles? The Medic may be up your alley, or if you’re a fan of all things flame, try out the room-clearing Firebug. There’s the Support Specialist, a class that prefers shotguns and welding doors, or the Sharpshooter who is proficient with handguns and headshots. The Demolitions, Commando, and melee-happy Berserker perk round out the roster. You can level up the perks through specific actions (healing as a Medic, explosive damage as Demolitions), with each level adding additional passive bonuses. These could range from a faster reload, better damage, discounts on certain weapons, to other, less significant bonuses. Higher levels even grant free gear like armor or a weapon when starting out. The good thing about this system is that you are not forced to play as a certain Perk to be able to level it up. You can get 9MM headshots as a Firebug, or heal your team as a Berserker and still rank up in the Sharpshooter and Medic roles, respectively. If there were a shortcoming to what is an otherwise very solid game, it would be in the audio and graphical department. 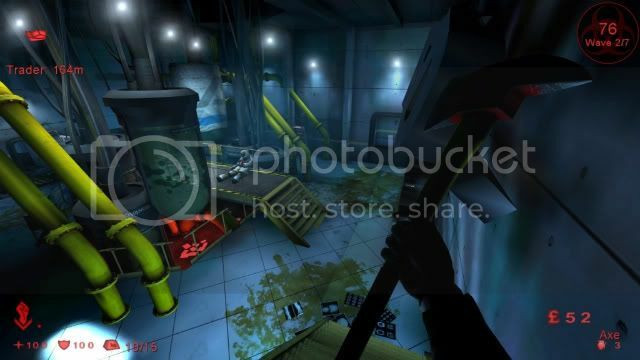 Weapon models look exceptional and some of the special effects like the Siren’s attack blurring the screen or the Flamethrower lighting up a dark hallway full of specimens are pleasant, but for the most part, the graphics are underwhelming, partly because the game is running on the Unreal 2 engine. Enemy animation can be stiff at times; character models in general are not that detailed nor are some of the stock maps that easy on the eyes. A majority of the voice acting, while able to make you crack a smirk at times, does get grating from its repetitive nature. The Trader only has a scant number of lines, and don’t get me started on how laughably lousy the Patriarch sounds. The music is generally of the metal variety, which isn’t my thing, but audio tracks do change depending on whether you are in combat or shopping at the Trader. I do want to make note of the weapon sound effects though; weapons sound like they have plenty of punch and headshots offer a rewarding splat. Killing Floor does use voice chat, and while other players may swear, most of the games I’ve played have had more mature folks. Voice commands and voice acting do use crude dialog, and since the game is based in the United Kingdom, there’s plenty of English slang and insults. Swearing (including the f-word) and some blaspheming can be heard, although the game doesn’t use these a lot. For a full list to those interested, check them out here. For $20, Killing Floor is a simple yet deep experience that offers flexible gameplay, rewarding action, and plenty of bang for your buck. It\'s very light on story, the presentation could be better, and the audio isn\'t so hot, but it\'s easy to look past those and have a blast, despite its shortcomings. While not a game for everyone, those desiring a unique take on the zombie genre may find a real gem here. I would recommend the title to gamers seventeen and up (per the M-rating), but I would advise folks concerned about the content to check out some gameplay videos first to see if it\'s it something you would be willing to purchase.